The Women's Health Resource Center, Great Expectations Pregnancy Program offers a variety of classes to help expecting mothers and their partners learn more about pregnancy, birth, breastfeeding, and parenting. View our January-June 2019 brochure. We help guide you into parenting and childbirth with the New Nest, Parenting, Breastfeeding Twins and Childbirth Intensives. Other programs we offer to support motherhood and parenting are MILK, Infant CPR, Expecting Twins or more or Afterglow our postpartum support class for mom and baby. Offering over 15 different classes to help expecting mothers and their partners prepare for their new roles. Gather more information here on class content, frequency and prices. Classes fill up quickly; please sign up well in advance. Note in 2019 some class start time and prices change. Pregnant, new parent or working? Get free information at one of our workshops. Class and Gift Package (Note 2019 class package prices will change). View the virtual tour, note on-site tour is elective. This workshop offers basic survival techniques to care for your newborn and emphasizes postpartum care for mom. Learn about newborn characteristics, infant milestones, bathing, hygiene, diapers, diapering, crying, comforting, sleep and recognizing the signs of illness. Great for first time parents. This class is offered in a two-part series or all day on Saturday. This class addresses the needs and interests of women who wish to have an intimate, fully-involved birth experience. This class covers the basic childbirth preparation content with an added emphasis on natural delivery and making choices in response to the birth process. A variety of labor support techniques and comfort measures is covered. This class provides an overview of the stages and process of labor, breathing and relaxation techniques, support, medication options, variations in labor including cesarean birth, and immediate postpartum care for mother and baby. A one-day workshop designed to give participants the basic tools and information for preparing for birth. This class incorporates all information from the Childbirth Preparation: Integrated Methods class into an accelerated format. Learn about the pain medication options available to assist you during labor and childbirth. Discuss your concerns or questions with a UCSF Anesthesiologist. Learn vital skills to handle an emergency. 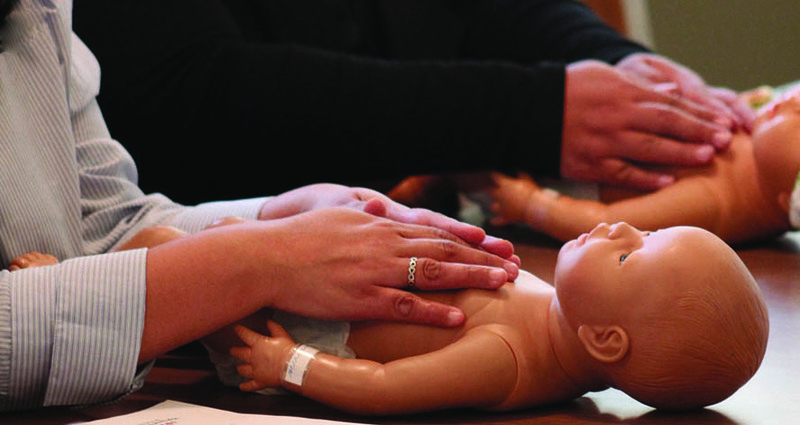 This class covers recognizing an infant or child in distress, performing emergency measures to relieve airway obstruction in a choking infant or child, performing CPR on an infant or child who is not breathing or is without a heartbeat and identifying risks of preventable infant and childhood injuries. This is a great class for parents, family members and childcare providers. Fee: One session class $110 per couple. Note: This is not a CPR certification course. In our Breastfeeding classes, you will learn about breast physiology, milk production, optimal positioning for mom and baby, establishing a strong milk supply, the basics of pumping and bottle feeding, and the partner’s role. Techniques to overcome breastfeeding challenges and establish a successful breastfeeding relationship right from the start are also covered. Learn about breast physiology, milk production, optimal positioning for mom and baby, and creating a strong milk supply. Techniques to overcome breastfeeding challenges and establish a successful breastfeeding relationship right from the start are covered. In addition, learn practical tips and postpartum advice on transitioning, working and continuing to breastfeed. Topics include: maintaining your milk supply, pumping schedules, collecting/storing/ transporting breastmilk, bottle feeding, and more. Fee: $110, All day on Saturday or Sunday, 9:30 am-2:30 pm. We're here to support and guide you through this journey as new parents. From joining one of our support groups to meeting with one of our lactation consultants there are a number of resources we can help you with. Both the Afterglow and MILK (Mother and Infant Lactation Kooperative) support groups offer an opportunity to share experiences, gain knowledge or simply get comfort and assurance in a safe environment. The groups are also a wonderful way to meet other new mothers. A FREE weekly breastfeeding and mother support group. Registration required. Space is limited, no drop-ins. Support group overview. This class teaches practical tips and advice on continuing to breastfeed your baby while working. Topics include preserving a breastfeeding relationship, choosing a breastpump, storing/collecting/transporting breastmilk, problem solving, and more. Support persons are encouraged to attend. Note you may also join us for Infant CPR & Massage, Parenting and Breastfeeding Basics after delivery. In this 90-minute workshop, participants will share practical tools that will help you transition from pregnancy to parenthood. Learn how to recognize the signs and symptoms of prenatal and postpartum mood disorders, such as anxiety and depression. Learn how parenthood impacts partnerships and how you can prepare for this role transition. Discuss the importance of self-care (for birth and non-birth parents) during pregnancy and the postpartum period, and learn about community support resources. Recommended after 20 weeks. Join us and find out how to take care of yourself during pregnancy. This class is designed to prepare expectant mothers on how to confidently breastfeed multiples. Learn practical tips and special considerations for nursing twins or more including latch-on, positioning, establishing a plentiful milk supply, and overcoming breastfeeding challenges. This one-day workshop is designed to give expectant parents basic information on raising twins or more including reassuring advice and practical considerations. Topics include important aspects of prenatal care, labor and delivery, feeding issues, and preparing home and family for the arrival of multiples. Try one of our packages and save! (Note 2019 class package prices will change). This Deluxe Pregnancy Package features our full day intensive class sessions that prepare expectant parents for the birth experience, the first few weeks, and beyond, including nursing. How early should I sign up? Classes fill up quickly, please sign up well in advance. You must register for all programs in advance and payment is required at the time of registration. Register and pay online at whrcportal.ucsf.edu/whrcmember OR call (415) 353-2667. What is the policy for rescheduling classes? Classes fill up quickly. In order to accommodate all clients, including on the waiting list, clients must reschedule no later than three full working days (72 hours) before the date of the class. You may pay by credit card online or over the telephone (Visa, MasterCard, Discover or American Express are accepted). Are classes reimbursed by my insurance? Great Expectations does not work with insurance companies. Please check with your health insurance provider for reimbursement or discount information. Can my support person also attend the class? Yes. UCSF Great Expectations Program encourages support persons to attend classes. All class fees include two (2) people. Are nursing (or other students) allowed to observe a childbirth class? Yes. There is a $40 fee per class. Two students maximum are allowed to observe in any class. Please call UCSF Great Expectations at (415) 353-2667 to reserve a spot. Please have class date and registration fee payment ready at the time of enrollment. Disclaimer: Due to instructor illness or circumstances beyond our control, UCSF Great Expectations Pregnancy Program reserves the right to reschedule or cancel scheduled classes. We are committed to your health care education and will make every effort for you to make-up your cancelled class. Participants will be given notice by UCSF Great Expectations Pregnancy Program within a 48-hour period regarding a make-up session.